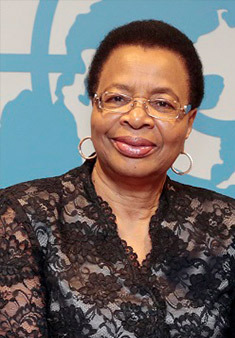 Ms. Machel is a former freedom fighter, the first Minister of Education of Mozambique (1975-1989), and an international advocate for women’s and children’s rights. In 1994, the then Secretary-General appointed her to lead an assessment of the impact of armed conflict on children; the resulting report still resonates today. Ms. Machel was, with her husband Nelson Mandela, a founding member of The Elders. She also founded the Graça Machel Trust and was a Member of the UN High-Level Panel on the Post-2015 Development Agenda. As a member of the AU Panel of Eminent African Personalities, Ms. Machel played a critical role in the mediation of the crisis following Kenya’s December 2007 elections.